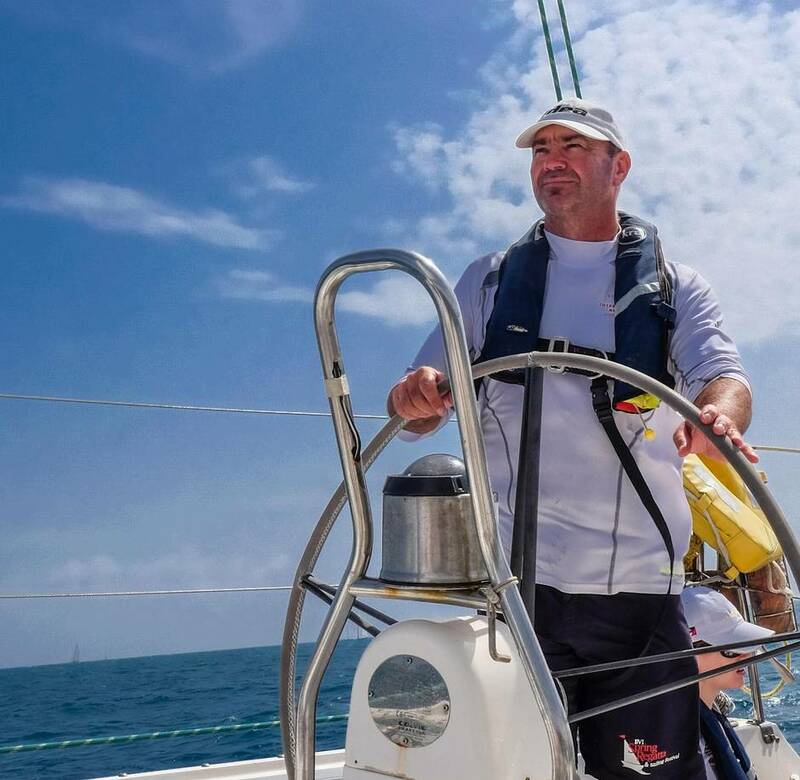 “This ain’t no floating gin palace taken out by some millionaire twice a season for sundowners.” So says veteran English skipper Tony McBride as he pilots our ocean-racing yacht, Spirit of Juno, through Antigua’s historic Falmouth Harbour. The Farr 65 was originally designed and built to compete in the legendary Millennium Round the World Yacht Race, and Juno is still one of the fastest yachts afloat. Admiral Nelson once moored his fleet in Antigua, launching sorties from here against marauding Caribbean pirates. 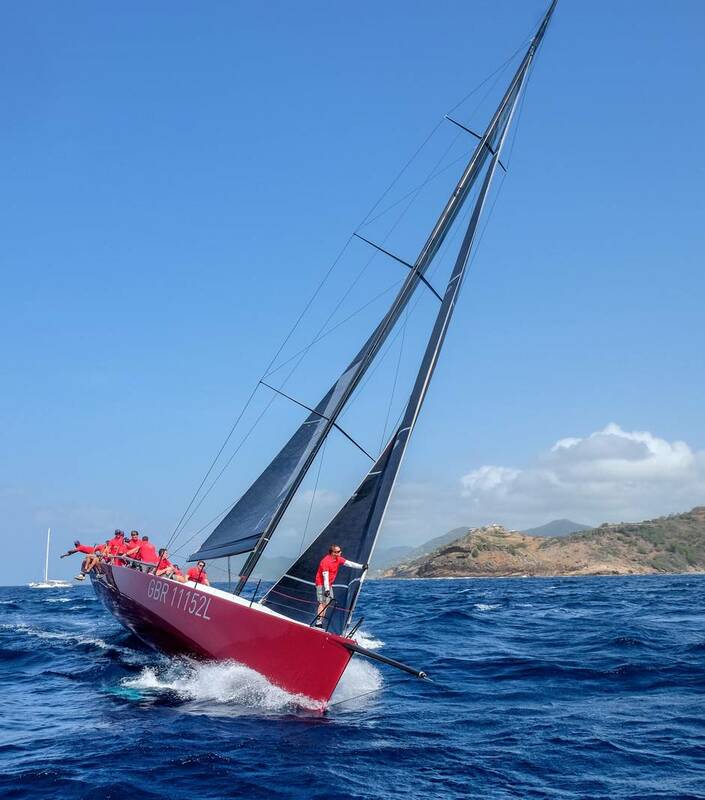 Well over two centuries on, the captain and crew of Juno are sailing into another battle – the annual round-the-island race kicking off Antigua Sailing Week. 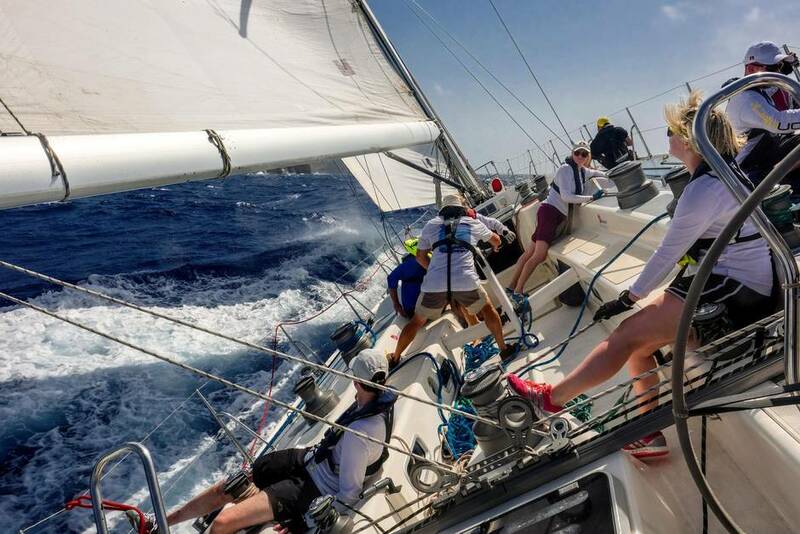 The Caribbean’s longest-running and most famous ocean yacht regatta celebrates 50 years in 2017 and draws professional crews from more than 20 countries – along with a few nautical neophytes like me. Tucked between Montserrat and St. Barts in the eastern Caribbean’s Leeward Islands, lush, languorous Antigua is blessed with 365 sand-sculpted, reef-lined beaches – famously one for every day of the year. It also offers some of the Caribbean’s finest sailing conditions, with year-round temperatures of around 27 C and steady easterly breezes blowing at close to 20 knots in high season. Yachting has an illustrious history on Antigua, and the island’s prime winter racing season features prestigious international events such as the Caribbean 600, Superyacht Cup, Antigua Classic Yacht Regatta and Antigua Sailing Week. How did I get here, cast in a real life Rolex commercial? Amazingly, I’m just two days into on-the-water basic training provided by Ondeck Antigua, which offers a five-day Royal Yachting Association-certified sailing course designed to teach beginners the minimum level of seamanship and helmsmanship required to be a useful member of a racing yacht’s crew. And they teach much of it aboard boats like Juno. Arriving at the starting line half a mile offshore, Juno aggressively jockeys for pole position with 11 other yachts. Among them are several that have competed in the America’s Cup, the Super Bowl of ocean-yacht racing. “I’m bullying these other boats, swinging purposefully close to them – like jousting – keeping them out of our space,” shouts our burly, wind-burned commander as Juno wildly swerves within a few metres of our foes, tacking, jibing, trying to steal their wind in a very expensive game of high-stakes, high-seas chicken. From Vancouver’s Spanish Banks, I’ve often watched gleaming yachts – their mainsails billowing as they escaped their terrestrial tethers – and wondered what it must feel like to be aboard. Three days ago, I couldn’t tell a jibe from a juniper bush. Now, I’m crewing in an oceanic Grand Prix as Juno rounds the first race marker of this 100-kilometre long regatta. It’s the nautical equivalent of journalist George Plimpton tending goal for the Boston Bruins. It’s a high-pressure, sink-or-swim environment aboard our floating classroom as we scramble – often with slapstick results – to execute on McBride’s terse instructions. I soon discover the key to successful ocean-yacht crewing is doing one job aboard and doing it well. Our captain has divided us into pairs assigned to haul, hoist, trim and – above all – keep one another from falling overboard as Juno slices through often-choppy waters. It may be all hands on deck, but we’re mostly all thumbs as the race unfolds. One unfortunate landlubber, a twentysomething real estate agent from London, succumbs to seasickness and spends most of the race vomiting off the stern. Another, a middle-aged businessman from Minnesota, frantically cranks the jib sheet winch so hard that he accidentally inflates his personal flotation device, sending him reeling across the deck. Sunscreen splattered bodies scramble from port to starboard, stern to bow. In ocean-yacht racing, as in most high-octane sports, timing is everything. Or, in Juno’s case, bad timing as we near the halfway mark of the race. Rounding another marker, skipper McBride orders the spinnaker sail dropped and the triangular jib sail fixed to the bow raised in one co-ordinated action designed to maintain our course and velocity. But disaster strikes as the half-hoisted jib becomes tangled. Then the twisting spinnaker gets away from the crew desperately trying to haul it in and snaps violently back into the water. It takes nearly the entire crew to finally heave and haul it out of the sea. Meanwhile, a rip appears in the flapping jib, rendering it useless. With only the mainsail left to power her, Juno is now virtually crippled and out of the race. “Shows you how quickly things can go wrong in ocean racing,” snarls a deflated McBride. As Juno limps back to port, we pass an idyllic indent, Carlisle Bay, a seagull’s soar from Falmouth Harbour. Unlike some of Ondeck’s students who’ve opted to live aboard their yachts during basic training, I’ve traded an amidships berth for a beachfront villa on a palm-fringed white sand beach surrounded by dense, emerald rain forest. After all this onboard intensity, it’s a relief to retreat to tranquil Carlisle Bay, definitely an upgrade over any cramped ship’s quarters. This posh hideaway with split-level oceanside suites and genuine laid-back West Indian hospitality partners with Ondeck Antigua to offer sun and sailing getaways. For this regatta rookie, the race results matter less than the thrill of an unforgettable aquatic adventure. The writer was a guest of Ondeck Antigua and Carlisle Bay Resort. Neither reviewed or approved the story. Air Canada and WestJet both offer non-stop flights between Toronto and Antigua. Ondeck Antigua offers a full range of internationally recognized Royal Yachting Association (RYA) courses, from beginner to captain’s level, as well as opportunities to crew in a number of professional sailing regattas. The RYA Competent Crew Five-Day Course I took, which teaches novices how to steer a yacht, hoist sails, handle ropes and general boat etiquette, starts at $1,200. More advanced courses, such as the five-day Yachtmaster Ocean Theory course that covers astro-navigation and worldwide meteorology, cost around the same. For further pricing and course descriptions, see ondecksailing.com. Editor's Note: An earlier version of this story incorrectly said Carlisle Bay Resort is a sister property to London's One Aldwych Hotel. This version has been correction.